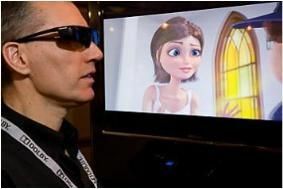 BRISTOL SHOW 2010: More details of our 3D TV demo | What Hi-Fi? In addition to a pair of 3D-enabled LG 47LD920 TVs and LG BD570 Blu-ray player in the main demo room, we also have a Samsung 46in 3D TV and Blu-ray player on display at the front of the stand. Inside the demo room we're running the LG 3D TVs and Blu-ray player with a stunning 9.2 KEF Reference AV surround speaker system, driven by an Onkyo PR-SC5507 processor and PA-MC5500 nine-channel power amp, pumping out 220W into 6 ohms. The KEF Reference speaker system consists of the Model 203/2 front speakers, Model 204/2c centre, Model 206ds rears and two powerful Model 208 subwoofers. If that isn't enough to whet your appetite, then don't forget we've also got £10,000 of amazing AV kit to give away in the show competition. What's more, we've got a special show subscription offer: sign up for the magazine and you'll get a free Logitech Harmony 700 universal remote control (while stocks last) or a Chord Co SuperShield HDMI cable worth £50. See you there!